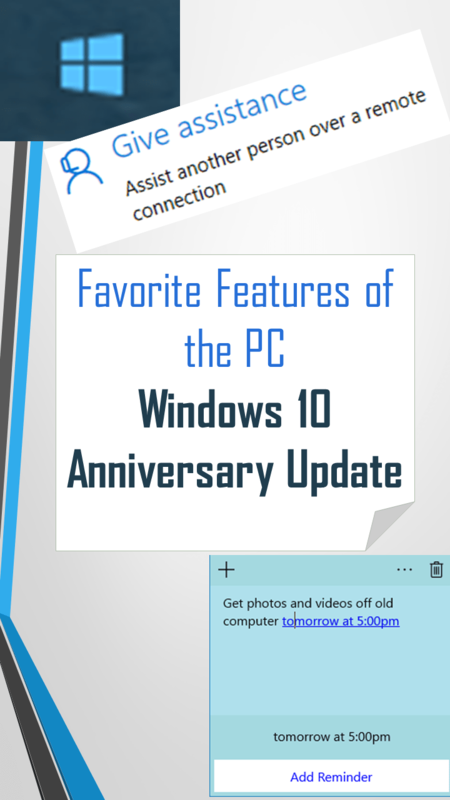 Windows has been rolling out updates for the one-year anniversary of Windows 10 and I am so excited about the new features! I’ve always been a fan of the Windows operating system on all devices including the Windows Phone. There are so many new options with this update but here are a few of the improvements that caught my eye. This is the new feature that I am so excited about! I am always trying to explain how to do something to my mom over the phone and it is a nightmare. By the time we are a few minutes in we are both completely frustrated and haven’t gotten anywhere. I’ve used products like TeamViewer in the past but even to navigate to the address bar was tough because she usually uses Google or Favorites to get around. This program is very simple to use and I’m certain it will be very helpful! This is fantastic! I can now easily view my calendar events that are synced to my phone by clicking on the taskbar calendar. I am always using the calendar in the taskbar to count weeks and days and plan for scheduling and the addition of the events is perfect! I had no qualms with how the menu has been laid out in any of the previous versions, but after this update, the menu is the easiest to navigate that I’ve ever seen. I have my favorite programs pinned as tiles and all of the programs are listed on the left. This is very similar to the layout on my Windows phone with the only difference being that I scroll over to the right on the phone rather than looking at the left on the computer. At first I wasn’t very fond of these smart sticky notes because the ‘smart’ section covers up some of the note. Most of my notes had a note and a web link. Then, I was sitting at my computer and I thought of something that I wanted to do at a later time. Typically, I would then pick up my phone and schedule a reminder in the calendar. Instead, I decided to try using the sticky notes. I wrote the reminder on the note and then clicked it to schedule to the calendar. It was so easy! This feature hasn’t been rolled out to my computer yet, but Windows says you will soon be able to answer calls from the PC. I can already text someone from the PC and the computer lets me know if I missed any calls. I’m very excited to see how the phone call part works. I did notice that the texting wasn’t the cleanest app and I had some troubles loading and knowing if the text was sent. I haven’t tried it in a few months though. As a blogger, this is the one that I am most excited about. Windows Ink is currently an over-app experience and it seems that you can’t save the ink. The Windows Insiders are currently testing Windows Ink in the Microsoft Suite: Word, Excel, PowerPoint, others. This gets me very excited because I create all of my graphics in PowerPoint. This will make my customization so much easier! I’ve already played around with the new feature over the screen a few times and the ruler feature is just perfect for making straight lines. I am always so impressed with all of the cool things Windows creates. I love all of their products (and no, I’m not sponsored or an affiliate for Windows). Last year I actually switched to an Android phone for about two months to bridge the gap between one phone breaking and a new phone coming out and I absolutely hated it! I complained every day about something and of course, switched right back to the Windows Phone as quickly as I could. The seamless connection between the phone and computers and all of the great features on both products makes my blogging life and personal use so much easier! I’m definitely starting to appreciate windows 10 as compared to before. I really did not want to upgrade until someone at home accidentally hit the yes button. These are awesome, thanks for the heads up! I am not a Windows user, they lost the plot after XP and my husband and I moved over to Linux and have never looked back. That said, it is still nice to know what is available. The start menu apps list really comes in handy. I want to learn about phone calls on PC though. I like that there are so many features that make organizing and scheduling easier. I have to look into these! Windows is brill I don’t know why people hate on it so much I think its ace. I don’t know if I could live without my iPhone! But all of these features sound great. There aren’t many people who talk about window phones. You’re right. I’m so surprised that more Android users haven’t switched. iPhone/iMac connections are fantastic and Windows does the same thing. There’s so much more functionality if you have both. I don’t have a PC anymore I switched to a Mac over a year ago and have never looked back. I really enjoy my Mac and will be sticking with it for years to come. I also have an iPhone, iPad and my husband has his iPhone and iPad so we are an apple family I guess. The smart sticky notes is all what I needed. Great to see how windows 10 has been innovating to make users more organised. I loved the anniversary update, there are some cool features but after it I wish I had touch screen on my laptop because there are some useful features if you have touch screen. Overall looking more stable and smoother. I didn’t switch yet to windows 10, I am still using the 8 version. These features sound really interesting. I am planning an update soon, together with a clean of my laptop so I’ll get a chance to try them out quite fast. I’m not a windows person but your tips and advice sound very practical and helpful. people always say that everyone is having iPhone but that’s not true. Most people around me have an anroid or windows one. I’m addicted to apple but now I don’t know how I would operate without my iPhone, macbook, watch, everything is just connected. I need to start exploring and this post is a good start. I love using windows and its so user friendly and compatible but I haven’t checked 10 yet!